After the first suit fitting, we decided to head over to Hong Kong island and took the lovely old Star ferry across the bay. It is such a romantic way to travel, but a shame that most of the dramatic skyline was hidden behind a foggy cloud! 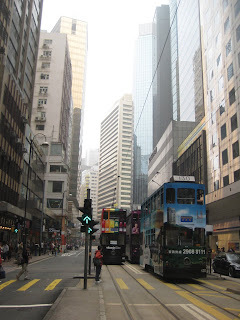 We had lunch at a stylish restaurant overlooking the busy streets, took a rickety tram ride to Central, and then walked up the narrow, steep slopes to the Soho area, where there are lots of antique shops as well as stalls selling wares. 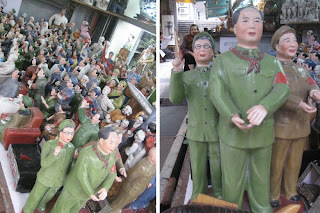 One had a stall full of Mao statues of all shapes and sizes. It was really nice to be in an area that was slightly less frenetic and away from all the skyscrapers and noise of the traffic.